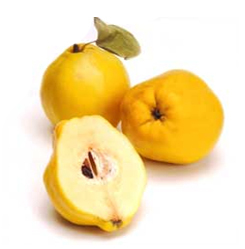 You are at:Home»Herbs»Pyrus cydonia Linn. Latin name : Pyrus cydonia Linn. Description : The seeds are anticatarrhal, antiinflammatory, antipyretic, antitussive, astringent, cardiac, cephalic, demulcent, diuretic, expectorant, laxative, mucilaginous, restorative and tonic. The seeds contain significant quantities of mucilage and thus are helpful in bronchitis, cough, tuberculosis and sore throat. Also effective against inflammation of the mucous membranes, intestines and stomach. Recommended Dosage : 3 to 9 g powder of dried seeds and 30 to 40 g of soaked seeds.